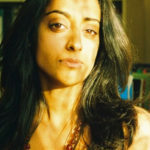 Sandeep Parmar is Professor of English Literature at the University of Liverpool where she co-directs Liverpool’s Centre for New and International Writing. She holds a PhD from University College London and an MA in Creative Writing from the University of East Anglia. Her books include Reading Mina Loy’s Autobiographies: Myth of the Modern, an edition of the Collected Poems of Hope Mirrlees (Carcanet, 2011), and two books of her own poetry published by Shearsman: The Marble Orchard and Eidolon, winner of the Ledbury Forte Prize for Best Second Collection. Most recently she edited the Selected Poems of Nancy Cunard (Carcanet, 2016). Her essays and reviews have appeared in the Guardian, The Los Angeles Review of Books, the Financial Times and the Times Literary Supplement. She is a 2015 BBC New Generation Thinker and co-founder of the Ledbury Emerging Poetry Critics scheme for BAME reviewers. desiccate widowhood mealing itself in air. candles, a portrait of a lady in high-collars, jet beads, faraway in the eye. at the altar of the fair husband. en toto, clean from the ears. invigilate the changing of the shift. in my lady’s chamber and couldn’t get up in the morning. bring me gin by the fire on the lawn of Ottoline’s garden.